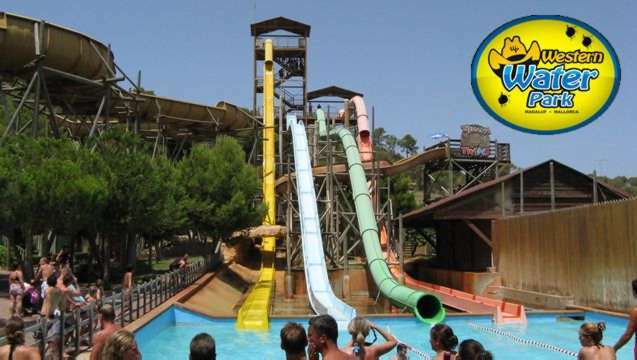 Tourist information and guide to aqua & water parks around Santa Ponsa, Majorca, Spain. There is no water park in Santa Ponsa, but there holidaymakers may find some great ones around Santa Ponsa, along Majorca, at the nearby towns. Closest water parks to Santa Ponsa are located at the Palma Bay. The Palma Bay has two water parks. One of them is the famous Western Water Park in Magaluf (6 km. from Santa Ponsa) and the other one is the Aqualand in El Arenal (38 km. Santa Ponsa). Western Water Park is located in Magaluf. Holidaymakers may find free buses from Palma Nova, Santa Ponsa and Paguera. There are many shows and pretty cool rides at the Western Water Park.